Just in time for Read Across America Day and Literacy Week, a VERY fun package arrived in the mail from The Trashy Crafter! Kim is another book lover and she has turned her love of reading and travel into an amazing and creative business! 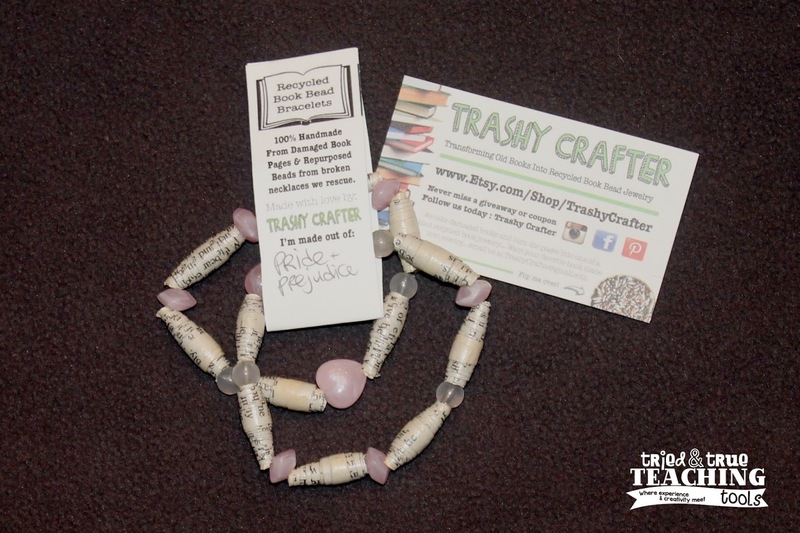 Read all about Trashy Crafter, then enter to WIN your own set of bracelets!! 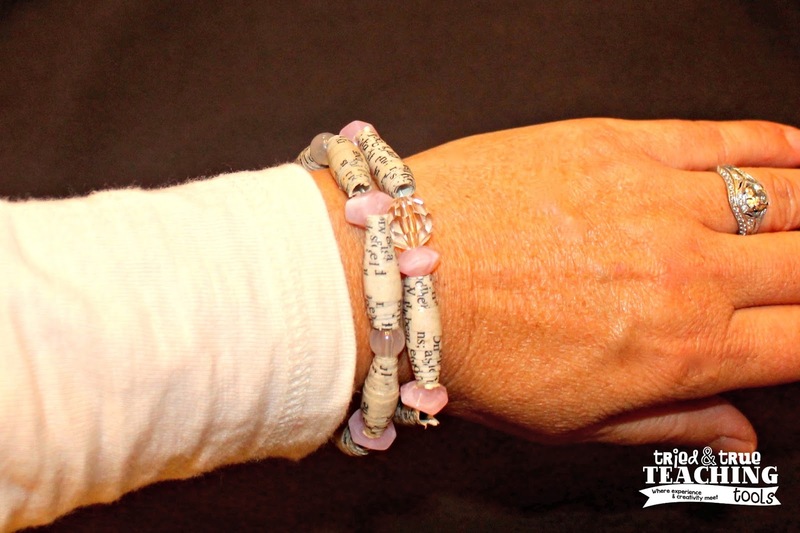 I LOVE that she takes books that would have otherwise been thrown away and makes the pages into beautiful jewelry!! 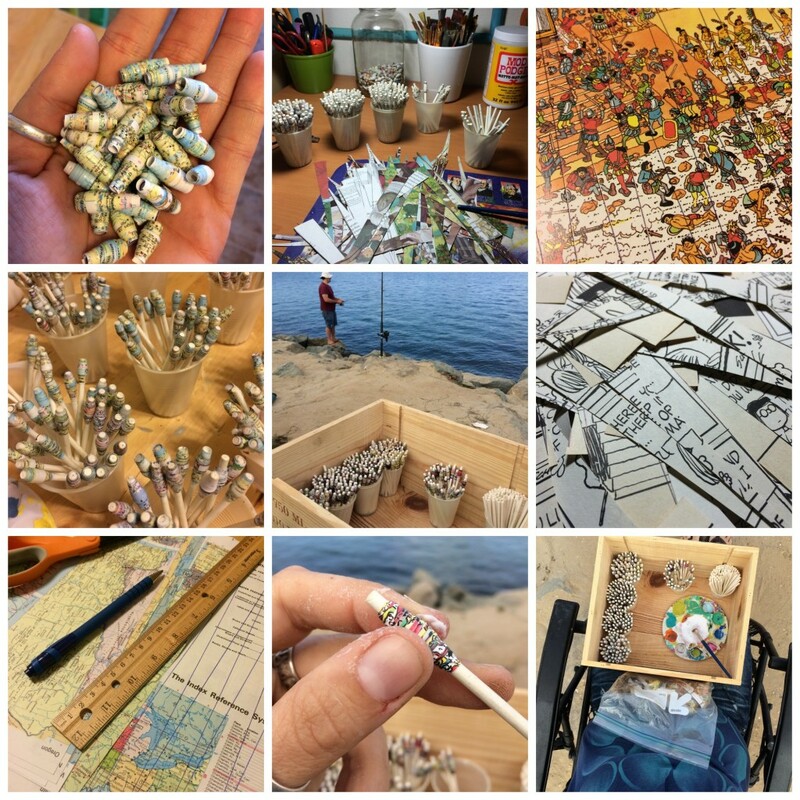 She also takes maps and repurposes them into beads! They gather the books from many different places; sometimes they find them in cardboard boxes outside of libraries, in thrift stores, and they even get books, maps or sheet music donated from folks that love and support their mission. Once they gather all of the books, they measure and hand cut the book pages into long narrow triangle strips and roll them one at a time onto lollipop sticks. 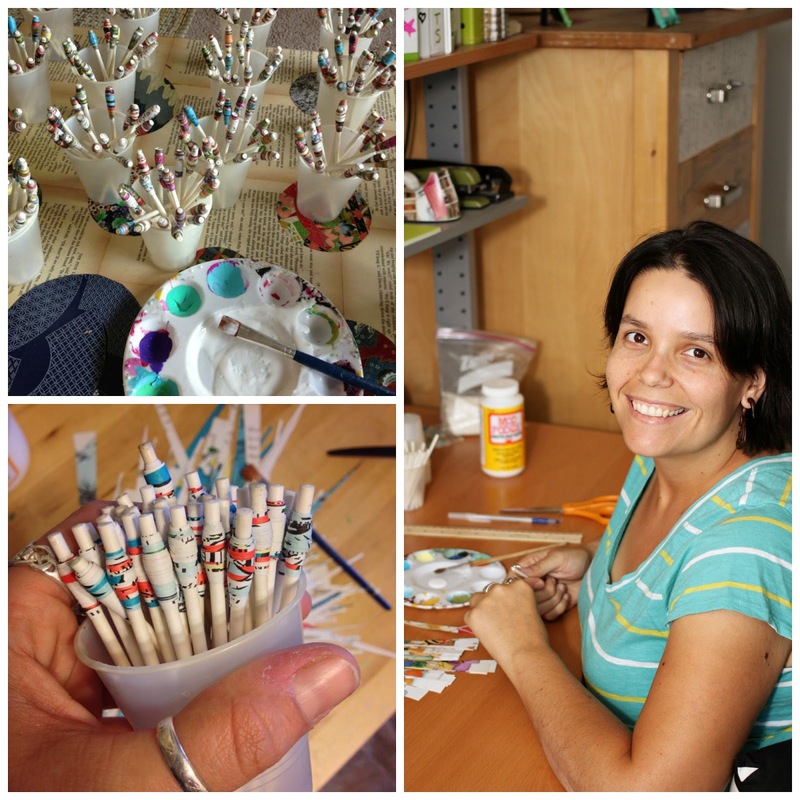 Next they coat each bead with Mod Podge, 3-5 times depending on the thickness of the paper. Once that is done, they spray them with a matte finish and start to make them into the finished jewelry. Kim and her mom also purchase damaged necklaces and bracelets from local thrift stores and strip them apart to repurpose the beads. 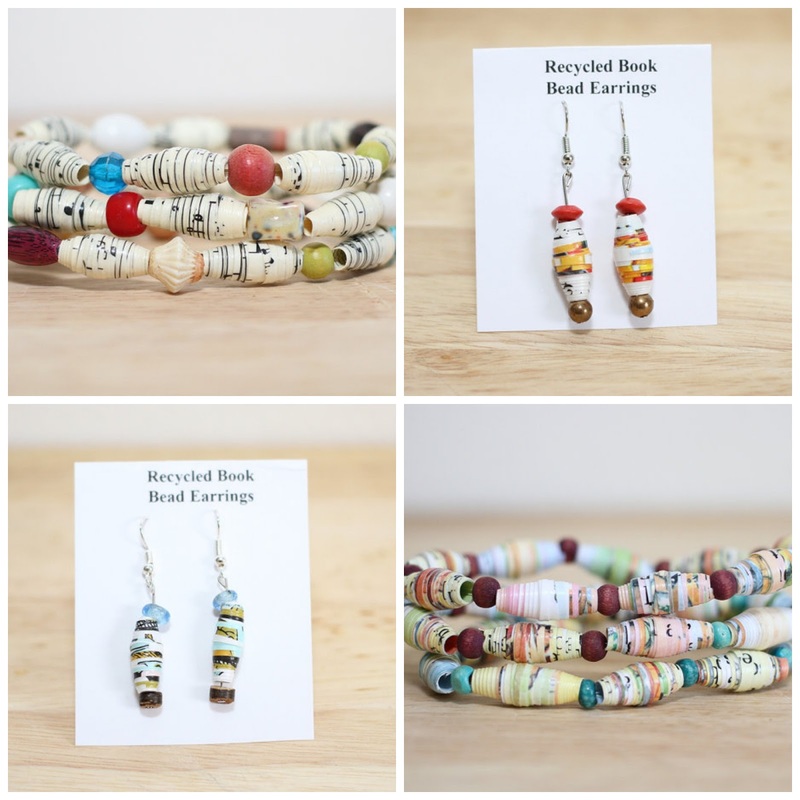 They create the jewelry with a mixture of the paper book page beads they made, along with the repurposed beads. Once that is finished, they cut recycled cardboard bracelet holders by hand and place the book labeling on to each set so folks know what book their bracelets were made from. I love knowing which books the jewelry came from!! As you can tell, great care and love is put into each one of their unique pieces!! I immediately chose a bracelet made from Pride and Prejudice, one of my daughter, Kayla's and my FAVORITE books (& movie!) and of course because there were pink beads! I have gotten SO many compliments on my bracelets, and of course I then have to share which book it is from and that leads into wonderful conversations about favorite books and stories!! And I JUST saw on Instagram that Trashy Crafter has now made recycled book cover earrings; they are ADORABLE!!! Be sure to follow Trashy Crafter on Instagram (use #trashycrafter) and leave a comment below letting me know you followed her and YOU can WIN a set of bracelets!!! And because Kim is SO generous, she is giving my readers 15% off anything in her shop for a month!! The coupon code is booklover. Take advantage of this fantastic offer!! And good luck; I hope you win! So glad you found both of us!! You will LOVe Trashy Crafter's jewelry! Thanks for stopping by! !